NSF File Splitter tool perform safe and secure splitting of NSF file including all emails, databases, archives & contacts (names.nsf) into easy & manageable parts. The Software successfully reduce size of NSF file without any inconsistency. Lotus Notes archive splitter software possess strong competency to Split NSF file even if the file is secured with strong password. An encrypted Lotus notes file can also be divided using the software very easily. 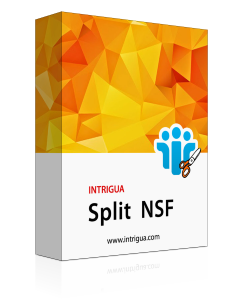 NSF File Splitter Tool provides a mechanism to compare the split resultant NSF file with the original NSF file. This is done using Log report which is in CSV file format and contains information like folder path, size difference etc. The NSF split Software provide support for all version IBM Lotus Notes ranging from the latest one 9.0 to the previous version like 8.0, 8.5, 7, 6 & below. The software has no compatibility issue with any of the listed lotus notes versions. Splitting of lotus notes NSF file into various small parts is performed in a manner that it will not affect the integrity of NSF file. Software doesn't alter or modify any single bit of information. All the NSF file data will remain intact as in original after splitting. In this technical era, all official or non-official communication were now taking place via emails. An individual received large number emails day by day that will lead to increase in size of email storage files. The IBM Lotus Notes mail client organize and store data into three repositories of NSF i.e Database, Archive & contacts (names.nsf). To manage the reciprocally increasing the size of NSF files or to reduce size of NSF file into manageable one we have to divide or break it into smaller parts. This can be done with the help of Exclusive INTRIGUA Split NSF. This Option will split the large NSF file into small equal size chunks. The Tool offers to specify the size of parts that is been created for huge NSF file. Here you can divide it from the range of 30 MB to 50 GB accordingly. Using this option software allow you to split Lotus notes files according to the Folder i.e you can create separate NSF file for each folders and thereafter split the files according to the size . For example you can create inbox.nsf for inbox folder, outbox.nsf for outlbox folder & then further split the file according to size filter. Split lotus notes NSF file according to the date. This option will let user to trim heavy NSF file into small parts just by specifying the date. The lotus notes archive splitter thus creates a two new NSF files containing emails or other data that falls before specified date and after specified date. NSF File Splitter tool is smart enough that can split NSF databases according to year and create separate NSF file for each year. For example if the user selects split NSF file by 2013-2016 year then the software will generate three NSF file for each year respectively. Step 1: Launch the NSF File Splitter Software. Step 2: Specify Split Option. Have a look on this interactive video of Split NSF File Software that help you to know how to split large lotus notes archive file. This video is created for our user to get a quick reference of the functioning or features of exclusive NSF file Splitter tool. Yes, you can run Split NSF file software on windows 10 as the tool doesn't have compatibility issue with any version of windows OS. Is this software split Domino Server NSF files? Yes you can Split domino server NSF files with nsf splitter provided that server is in offline mode. Does this software trim password protected NSF files? Yes, lotus notes archive splitter will cut any password protected or encrypted NSF files. 20 MB of free hard disk space should be available to run Split NSF software. I am very thankful to the team for developing this software as it has helped me in managing my Lotus Notes database NSF file. It allowed me to split oversized NSF file into multiple NSF files according to the selected year. I am very pleased with the output and software performance. With the help of Split NSF Software, I was able to easily choose the mails exchanged between the desired date ranges and has helped me to store those mails separately in different NSF file and remaining item in other NSF file. The software offers satisfactory results.